Leaders in premium land and cruise holidays, Travelmarvel have once again joined with award-winning partners Great Rail Journeys to release a preview of rail adventures for 2019. 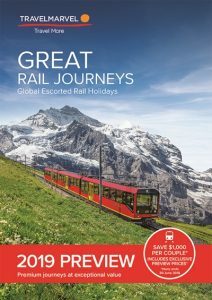 Covering well-traversed regions including Switzerland, Italy, Japan, the UK and the USA, the Travelmarvel Great Rail Journeys 2019 Preview brochure also opens up paths across China and India on a range of new journeys. Passengers can also take advantage of Early Bird Offers including savings of up to $1,000 per couple, or Fly Free on select tours. New to Travelmarvel’s collection of European rail travel, the Great Italian Adventure offers guests the chance to touch on Italy’s most loved sights, as well as some of its hidden gems. In the floating city of Venice, passengers can weave through the tangle of streets with a local guide. They can see the famous red-tiled roof of the Duomo in Florence. In Sorrento, they have the chance to sample the region’s renowned syrupy limoncello. Discount prices for this holiday start at $4,195pp, twin share, including savings of up to $1,000 per couple. Also new for 2019, The Grand Tour of China tour, sees passengers travel from Beijing to Shanghai via high-speed rail, including a three night cruise along the Yazgtze River, eliminating the need for any internal flights. Highlights of the trip include a visit to Chengdu’s Panda Breeding Research Centre and a traditional tea ceremony in Shanghai’s beautiful Yu Garden. Early Payment Discount prices start at just $5,495pp, twin share, including Fly Free and Early Payment Discount of $200 pp.